Bandage technology has gradually been revolutionised in the 100 years since Band-Aids were first introduced. Researchers from the University of Nebraska-Lincoln, Harvard Medical School and MIT are now ready to introduce the next century of wound care with the “smart bandage”. The smart bandage has individual fibres that store medications which can be later implemented using a smartphone or another mobile device. The bandage is made up of electrically conductive fibres that are coated in a gel that can house medications. Antibiotics and painkillers can be used within the bandage, and possibly many other effective combinations that will enhance recovery. This is an exciting platform that can potentially be applied to many different areas of biomedical engineering and medicine. Not only could it be useful for dealing with battlefield injuries, it could also help in the treatment of chronic wounds, which are common in patients living with diabetes. This is not the only “next gen” bandage in development. A team from Swansea University’s Institute of Life Science has created bandages laden with nano-scale sensors that can instantaneously transmit health information to medical professionals using 5G wireless data. A new medication may improve signs and symptoms of severe eczema, according to the findings of two Phase III clinical trials published on 1st October in the New England Journal of Medicine. A multi-institutional research team conducted the trials (SOLO1 and SOLO2) to test the effects of dupilumab (Regeneron / Sanofi) among 671 and 708 (respectively) participants with severe eczema. For 14 weeks, participants received dupilumab (300mg/w), placebo or alternate weekly dupilumab and placebo. The primary outcome was the proportion of participants achieving a score of 0 or 1 (clear or almost clear) on the Investigator’s Global Assessment and a 2+ point reduction in that score from baseline at week 16. The findings from SOLO1 and SOLO2 showed primary outcome occurred in 38% and 36% of participants who received dupilumab on alternate weeks and in 37% and 36% of those who received it weekly, vs 10% and 8% of placebo group, respectively. Most patients who got the active drug, dupilumab, instead of a placebo reported that the itching began to wane within two weeks and was gone in a few months, as their skin began to clear. Nearly 40% of participants getting the drug saw all or almost all of their rash disappear. The drug blocks two specific molecules of the immune system that are overproduced in patients with this and some other allergic diseases. The only side-effects were a slight increase in conjunctivitis, an inflammation of the outer membrane of the eye and swelling at the injection site. Eczema & psoriasis is one of the categories covered in our round-up of OTC skin care treatments that are being published in the September and October editions of all four OTC INSIGHT titles. This week, OTCs In Action are targeting the not so nit-picking issue of super lice. For the past few months, the head-scratching solution to the problem of how to defy new bionic strains of lice has plagued traditional OTC pesticide marketers. New evidence from The Journal of Medical Entomology (JME) found that head lice have developed resistance to two types of common OTC insecticide treatments for lice infestation. Over the past year, 98% of head lice in at least 42 states managed to grow gene mutations that enabled the (super) lice to become resistant to pyrethrins, pyrethriods and permethrin. However, the invasion of the mutant lice shall no longer reign. Prestige Brands have launched a new product, Nix Ultra, to tackle the super lice epidemic. Nix Ultra safely kills both traditional and super lice, as well as their eggs. The combination of mineral oil and dimethicone provides optimal coating and coverage of both lice and hair, creating a slippery surface so lice and eggs, even the pesky super strain, can be easily removed. This is one of just a few super lice OTC treatment products available on the US market and, with super lice rapidly spreading in the US, there certainly (for now) seems to be a safe and reliable solution for worried parents. This month, OTCs are in Action in South Africa, where ad agency FCB Cape Town made sun safety fun with a giant inflatable Nivea Sunslide that dispensed sunscreen. Equipped with goggles for protecting their eyes from the lotion, kids – and some adults – had a great time slipping on their sunscreen during the event. FCB thought up the SunSlide campaign after learning that South Africa has the world’s highest rate of skin cancer, according to the Skin Cancer Foundation. The massive water slide is equipped with hundreds of spray-jet portals and filled up with 50 litres (roughly 13 gallons) of SPF 50+ waterproof sunscreen to ensure all participants get equal coverage. Last year, FCB Brazil was lauded for the Nivea doll campaign, which gave Brazilian children hands-on experience with sun-sensitive dolls that would turn lobster red if Nivea sunscreen was not applied in time. Sunscreen ingredients are classified differently around the world – cosmetics in many countries, drugs in the US – but their efficacy in disease prevention is undisputed. Of course, that’s only if people use them – kudos to FCB for brilliant consumer behaviour tweaks! It’s an election year in the US, and there’s no end of conversation about the controversial candidates, and the Red states (more Republican voters) and Blue states (Democrat); but which are the Pink and Green states? 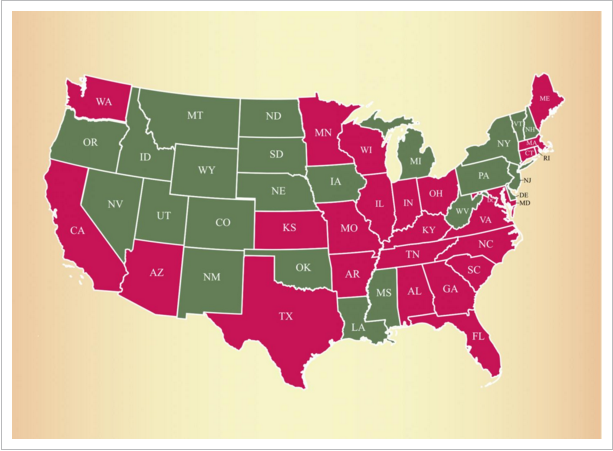 Well, parents and caregivers in the Pink are actually feeling blue (or seeing red) because these states have high populations of treatment-resistant lice, otherwise known as Super Lice. Across the country, Super Lice are causing school nurses, teachers, parents and caregivers to tear their hair out with frustration as nasty nits keep reappearing in spite of treatment, with one classroom infestation familiar to this writer clinging on for two months this winter. This is OTC research & development at its best – providing a solution for people with a health-related problem with an easily accessible and affordable product.